Please check out the sites for musicians and music makers in our network! SonicScoop is a NYC-based online news source and community bridging the music and recording industries. Via articles, video and podcasts, SonicScoop gets up close with top producer/engineers, composers and entrepreneurs; goes inside successful studios; supplies the latest tech production tips, insights and gear reviews; and reports on emerging business trends. The SonicScoop Classifieds are live and in BETA. Find what you need in audio and music, from people you trust. SonicScoop's readers take their audio seriously — we make it easy for you to connect. Place an ad or simply browse — the SonicScoop Classifieds are free to use, no commission. Visit today! 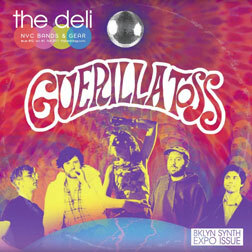 The Deli is the #1 site/magazine focused on local US scenes and the emerging indie bands who call them home. We have a blog in each region we cover - list here. Between 70k and 90k unique visitors per month. The Deli's Charts are the only all inclusive charts organized by region and genre, an interactive database updated daily that allows bands to network with each other. Check them out here. Delicious Audio is a blog exclusively focused on guitar pedals and home recording. Between 10k and 12k unique visitors per month. Delicious Audio is the official site of the Stomp Box Exhibit, an interactive event taking place in NYC and Austin where musicians are invited to test and compare pedals in the headphones. MixCon is a free educational event for musicians and aspiring producers/mixing engineers. Its goal is to advise them on the art of mixing, the science it's based upon, and the techniques top engineers employ to shape the sounds in the directions they envision, and to make them coexist in a balanced fashion. NYC based blogs The Deli (covering local emerging artists) and Sonicscoop (focused on recording advice and local recording pros) support and foster the huge local community of recording musicians and engineers. The NYC MixcoC is intended as a service to them and a free opportunity for learning and improving their recording techniques. Mixcon includes a pro gear expo where our sponsors will showcase their latest products and take the opportunity to educate visitors about plug ins, microphoes, studio monitors etc.